The tenor Gregory Kunde, who has recently made the transition from Rossini & Donizetti tenor roles to Verdi (he makes his Covent Garden debut as Manrico in Il Trovatore and will return as Verdi's Otello) won the coveted Best Male Singer at the International Opera Awards on Sunday 15 May 2016. No mean achievement at an age (Gregory Kunde is 62) when many tenors are thinking of winding down. Those with longer memories will remember Kunde for his Eneé in John Eliot Gardiner's performances of Berlioz's Les Troyens at the Chatelet Theatre in Paris in 2003. 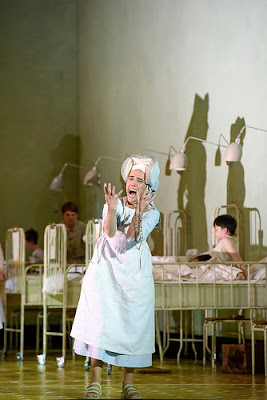 Best Female Singer went to Mariella Devia whose recent performances have included the role of Elisabetta in the Alessandro Talevi's production of Donizetti's Roberto Devereux at the Teatro Real in Madrid (a production originally seen at Welsh National Opera). The Readers' Award when to soprano Ermonela Jaho who has recently pleased audiences and critics alike in Puccini's Il Trittico at Covent Garden, and as Leoncavallo Zaza for Opera Rara (soon to appear on disc). Opera Rara popped up at the awards in the CD Complete Opera category, which was won by their recording of Donizetti's Les Martyrs (where Mark Elder conducted the Orchestra of the Age of Enlightenment with Michael Spyres, Joyce El-Khoury and David Kempster). Other companies recognised include English National Opera whose chorus won the Chorus category, and Glyndebourne which won the Festival category. Whilst the Opera Company category was taken by Dutch National Opera. Laurent Pelly was the winner in the Director category, whilst Vicki Mortimer (whose work included the recent Lucia di Lammermoor at Covent Garden) took the Designer category.. In the Philanthropists, there were join winners; Bill & Judy Bollinger whose philanthropy includes Independent Opera, and the late Christine Collins who created the Christine Collins Young Artists at Opera Holland Park. The full list of categories and winners follows after the break.